Once blighted and abandoned, the block is now thriving with sympathetic infill new construction. The City Home Cincinnati project combines historic renovation with new, single-family town homes and provides private outdoor green space for the 12 new townhouses - Courtyard, Carriage House Homes. The final phase of the project, now nearing completion, sold out last week. “This is a testament to the value design provides. The new construction meets the requirements of an upscale modern buyer,” says Schickel Design principal Martha Schickel Dorff, “yet capitalizes on the beautiful fabric of small lots, alleys and pocket green spaces of this historic walkable neighborhood.” The new homes have been thoughtfully designed to accommodate modern lifestyles in a tightly laid out historic neighborhood including the friendly integration of pedestrian and vehicular spaces. And the homes are eco-friendly -- seven houses are registered to be LEED Certified and the other five, built in the project initial phase, have received Energy Star’s highest rating. Tucked among the new construction are renovations in a range of sizes. “The combination of new and historic strengthens both,” explains Dorff. She conceived the City Home Cincinnati project to broaden the range of new buyers to the area, particularly young families and older buyers. 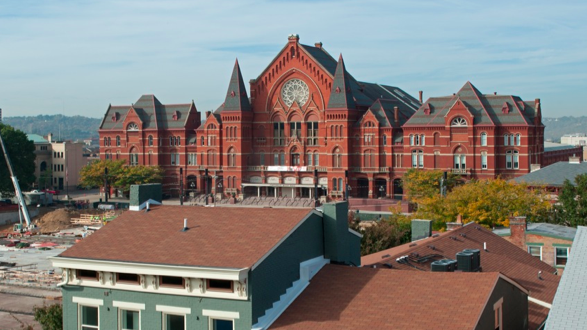 It has created a new kind of neighborhood in Over-the-Rhine and brought development further west toward Cincinnati’s world-renowned Music Hall and Findlay Market, Ohio's oldest continuously operated public market and one of the city’s most cherished institutions. The project has received numerous recognitions and awards including: CCDA - Greater Cincinnati’s Most Outstanding Collaborative Effort, 2009; CINCINNATI Magazine’s Best Street Makeover, 2009; URBAN LAND Magazine Publication, Embodying Synergy of Public Private Partnerships, Sept./Oct. 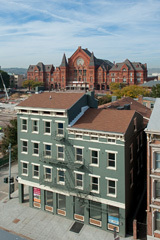 2010; and Over-the-Rhine Chamber of Commerce, Property Development of the Year Star Award, 2010.